Cyberfred and Lucas are translating my fanfiction to French! Read it here! Also, please visit his general KOR page here. Access to my compressed stories directory is here. Act V Part One: The End of the Road? 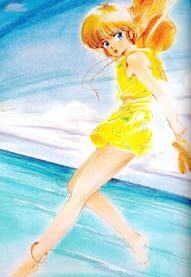 Introduction to the series: The following fanfiction stories written by me are based on the legendary romantic anime series, Kimagure Orange Road. I wrote it out of whim because I had plenty of free time on my hands. (i.e. free on Friday nights in October '95) Anyhow, the timeline for the story takes place just after Shin KOR I. Since I came up with most of the plot elements of the story before being aware that Shin KOR II had been written, this story is intended to represent an alternate timeline to Shin KOR II. (kind of like Star Trek, with various possible futures depending on the path chosen; also happened in Christmas TV KOR episode) Who knows? With Kyosoke's ESPer powers, he can pretty much jump back and forth in time all he wants and pursue different scenarios of the same situation. I've takened the liberty of incorporating some events and information from the manga, anime, and SHiN Kor I. (Which is all I've read of KOR!) Please be aware of copyright issues. I surely don't want to get in trouble with the author or publishers over this. This fanfic is purely for the enjoyment of KOR fans. Disclaimers about the story: The themes in the story can sometimes be very adult and graphic in nature at times. Be forewarned and read with discretion. The tone of these stories are mostly serious in nature; i.e. these stories are not written specifically to be capriciously or whimsically, although these situations do occur in some instances. If you have any problems with any parts of the story, be sure to send me constructive feedback by emailing me at this address: rk@soda.berkeley.edu. I hope you enjoy reading these stories. I know I did. Final Words:Last, the PRELUDE section listed here can be optionally read. You should read the Book A stories first, or read the stories by the date order in which they were written. Initially, I wrote the Book A stories first. By halfway through the book, I received a complaint from a reader at my audaciousness for killing off a certain minor, but still revelant KOR cast member. (You have to read my Book A chapters to find out who died! ;) ) This member was not even mentioned in the Shin Kor I novel, so I saw it fit to dispose of him/her and end their misery. But I decided to relent and write up some stories for him/her for good measure, being that they are dead already. Also, these stories help clarify some details mentioned in my Hard Kor Books which might confuse the reader. So these Prelude series stories is designed to enhanced the readability and enjoyment of the HardKor Saga. Contributions and feedback of any type such as constructive criticisms, flames, or maybe a few words of praise is greatly appreciated. Authors can't just get by on wine and water alone! Do you like the pictures on these pages? Please tell me. Email me at this address: rk@soda.berkeley.edu. Thanks for your patronage.